Heat ghee in a heavy-based saucepan and put over the flames of wood and wait until the ghee turns a hot, and then add the cumin seeds, bay leaf, peppercorns, cloves, powdered fenugreek and fennel seeds. When the seeds begin to splutter, add the garlic and ginger paste and the onions. Saute over high heat till brown. Add the yoghurt, stir-frying vigorously so that it blends well and does not curdle. Cook till fat separates. Add the garam masala, salt, turmeric, coriander and chilli powder. 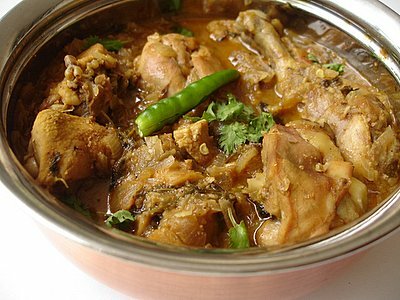 Keeping the heat high, add the chicken pieces and stir till they look a little opaque and are coated with the masala. Reduce heat by putting some angaras (coal). Add the green chillies and sliced onions. Continue cooking , till the chicken is cooked through and fat separates. Takes 10-15 minutes. The onions should be crunchy.